Lady in Yellow (Tiffany Tenille), Lady in Orange (Regina Monique), Lady in Red (Paige Mayes), Lady in Blue (Natasha LaGrone), Lady in Green (Brittany Nicole Sims), Lady in Brown (Jan Hunter), Lady in Purple (Bobbi Kindred). Some literary art breaks so much new ground and is so topical and so linked to its time, that its durability and continuing relevance may be questioned. As if the first revelation or the first sign of progress obviates the need to revisit the issues confronted by the piece. Ntozake Shange’s for colored girls who have considered suicide when the rainbow is enuf is a work of great moment that gave black women a platform, in some ways a pedestal, from which to denounce their double indignity of racial and gender discrimination and announce their worth and beauty. Sadly, although it broke through many artistic and social barriers, its concerns still resonate today. African-American Shakespeare Company’s welcomed revival exalts Shange’s poetry and her messages in a powerful and a well-crafted production. First performed in 1974 in the East Bay at Bacchanal, a women’s bar in Albany, the daring and unique for colored girls would reach Broadway two years later. Structured as 20 poems in common language with idiosyncratic spelling and punctuation, Shange coined it a choreopoem, referring to the integration of music and dance into the poetry. Collectively, the poems cry out for respect, recognition, and love for women of color. The playwright produced several other choreopoems, and other writers have adopted the idiom. As befits the title, the seven female actors are known only by the colors of their clothes. And they are more than enuf – a stirring collection of women of color. To borrow from the rock group War’s “Spill the Wine,” “There was (sic) tall ones, short ones, brown ones, black ones, round ones, big ones, crazy ones.” What they share is talent and the scars of their births – the collective unconscious of having suffered the bigotry and abuse in one or many ways of being black women. The women appear on a stark and mostly darkened stage adorned with little but seven white door frames. As each tells her individual story, clusters of the others gather as rapt observers. The unified responses add witness to many of the tragedies of black women’s lives, but there are also moments of unbridled joy, when the sorrows seem to briefly disappear. The vignettes include stories from all manner of black women, including a Creole from the Louisiana bayous and a black Hispanic from Spanish Harlem. One character falls in love with a fictional character; another looks to lose her innocence; a third only wants to dance. Not all stories score equally, but many are poignant and revealing, and together, they paint a rounded picture of the hazards of being a woman of color. While a number are sad, the most harrowing and memorable is “a night with beau willy brown,” delivered with gripping passion by Natasha LaGrone. It is an electrifying poem added to the play by Shange in 2010 to deal with the crisis of post traumatic stress disorder. Director Elizabeth Carter deftly orchestrates the scenes, and Stephanie Anne Johnson’s lighting adds visual drama. Choreographer Kendra Kimbrough Barnes’ arrangements suit the script, with the most significant dance performances coming from the lithe and nimble Paige Mayes and whirling corkscrew Regina Monique. Each of the performers deserve recognition, the others being Jan Hunter, Tiffany Tenille, Bobbi Kindred, and Brittany Nicole Sims. Interesting symbolic observation – What colors don’t appear in a rainbow? Black and white. 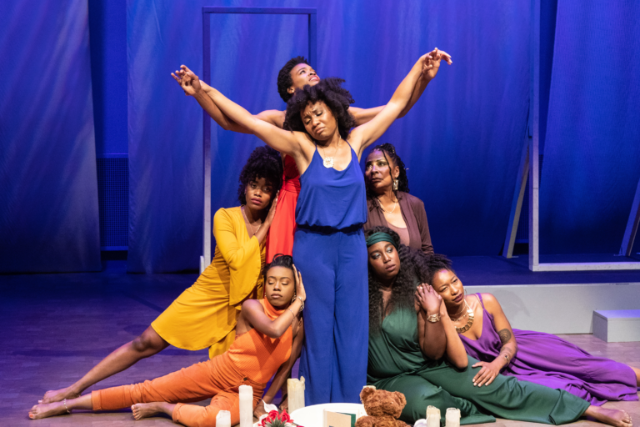 for colored girls who have considered suicide when the rainbow is enuf is written and produced by Ntozake Shange, African-American Shakespeare Company, and plays at the Taube Atrium Theatre at the War Memorial Veterans Building, 401 Van Ness Ave., San Francisco, CA through September 30, 2018.